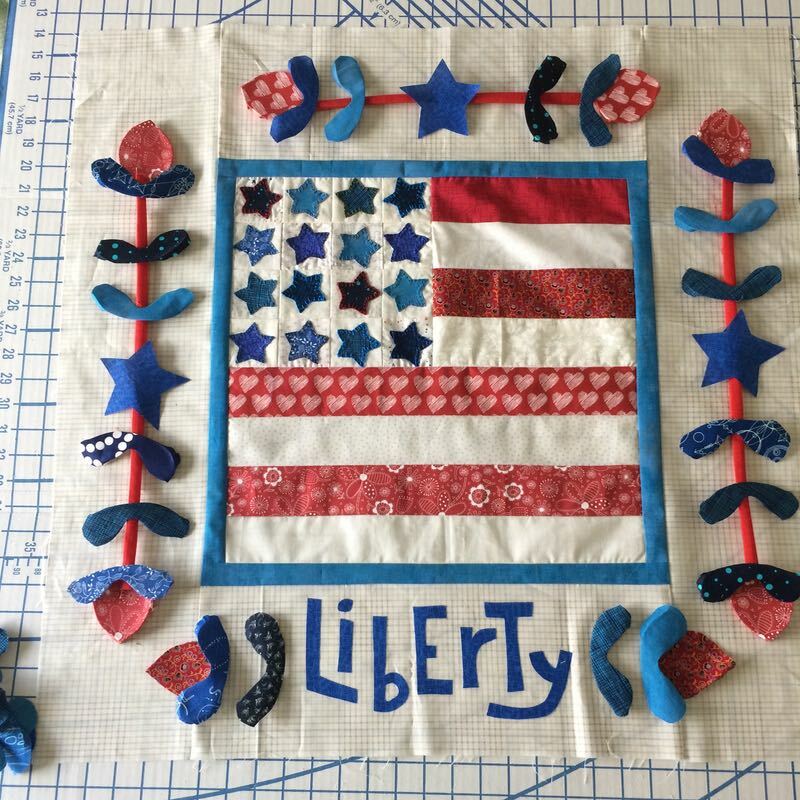 Liberty USA quilt | OccasionalPiece--Quilt! 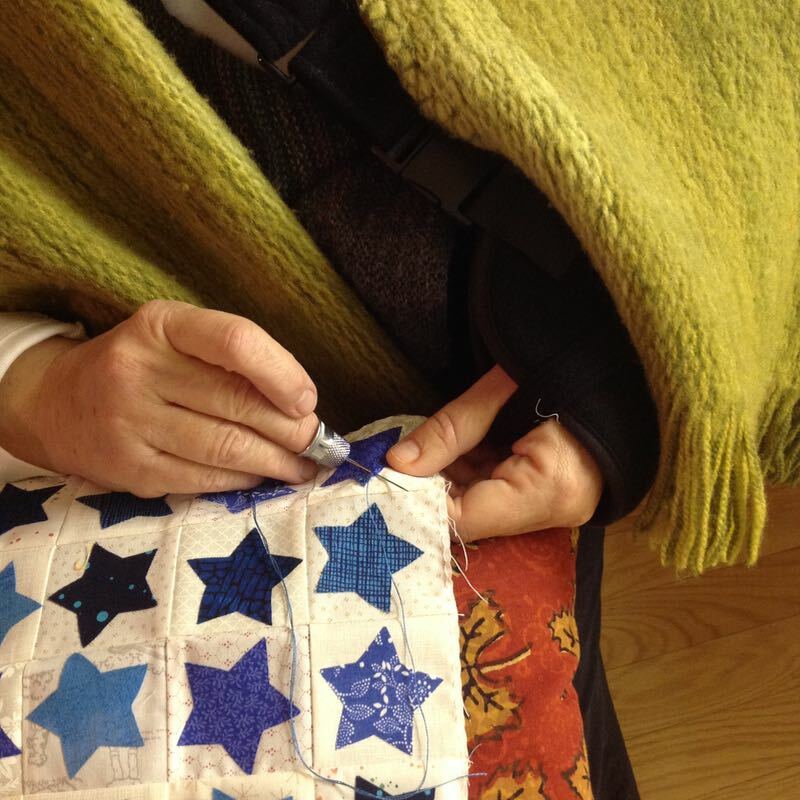 Posted on June 12, 2017 by Elizabeth E.
I started this in January, prepping up the stars and beginning the hand-blanket-stitching a couple of days after my rotator cuff surgery. 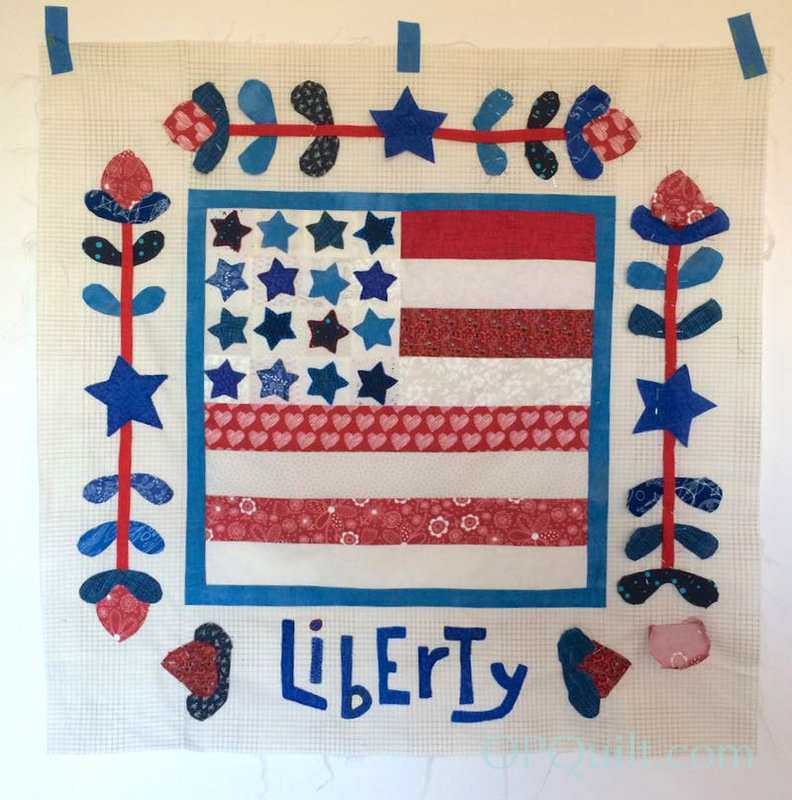 This was a bright spot during that time, keeping me focused as I moved forward through different steps of what I was calling my “Liberty USA” quilt. 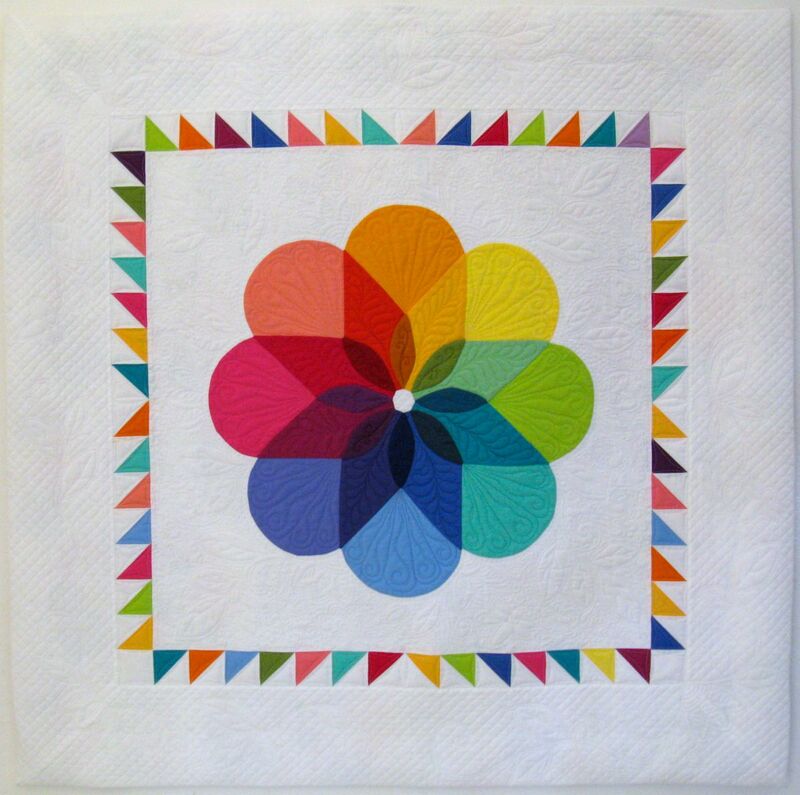 My friend Susan of Patchwork N Play, in Australia, is always hand-quilting her quilts, and I wanted to try that, too. 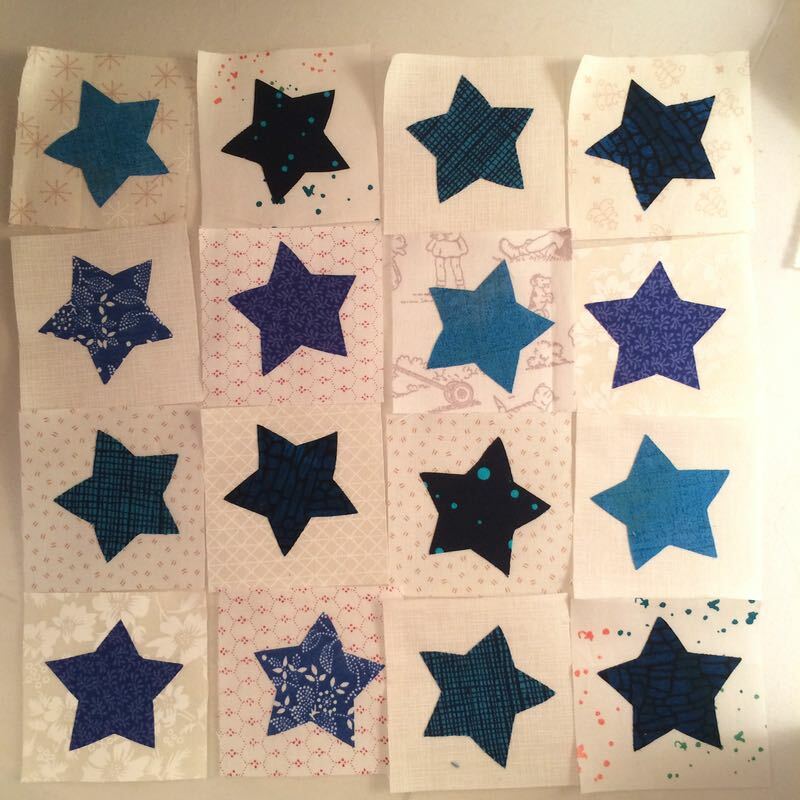 So I rustled up some patriotic colors of perle cotton from my Oh Christmas Tree quilt, and went to town…well, riding on a pony and all that, because it took some time to do this. I cut some fabric for the rod pocket this week and on the selvage, I saw this. Perfect for my title, I thought! 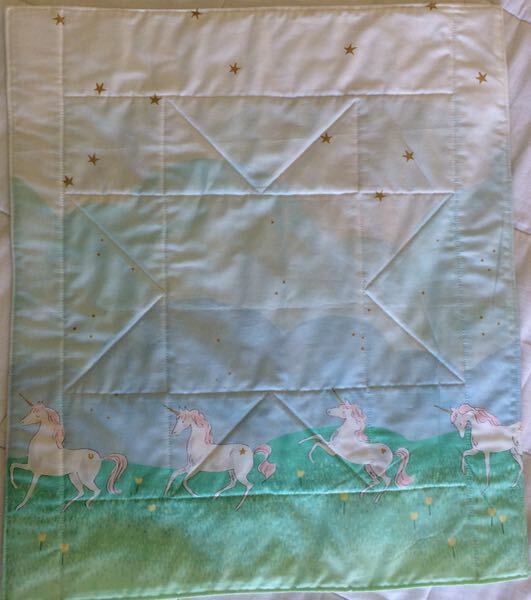 It’s up there, stitched onto the rod pocket in the upper right corner. I listened to Hamilton, the novel, last year and one take-away for me was how imperfect our early Founding Fathers were, but what a magnificent thing they created as they pulled together and figured out our country and its laws. They had patriotism in its purest form: e pluribus unum, out of many, one (our country’s motto). 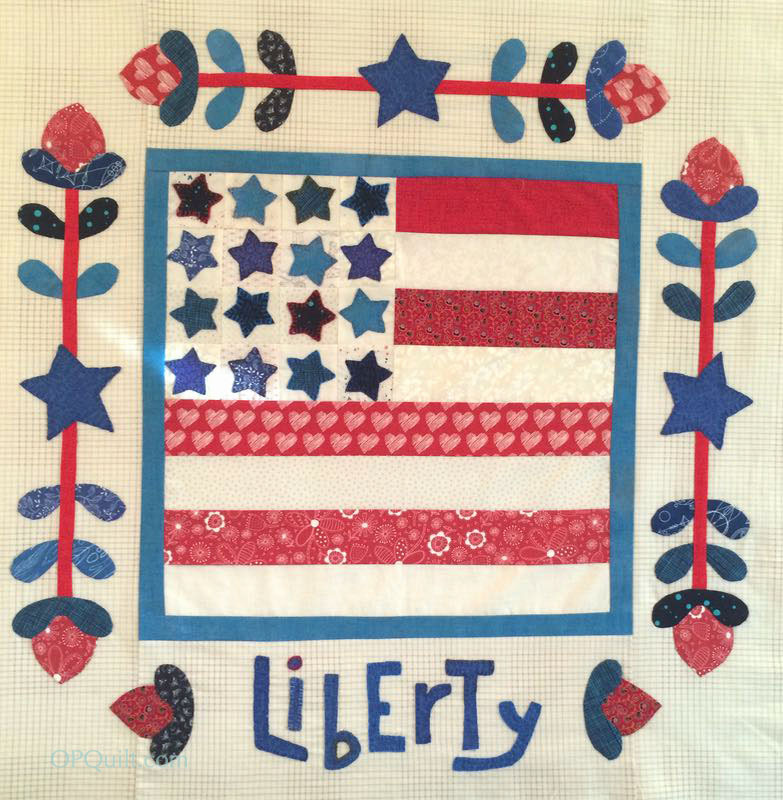 I try to keep that ideal in my head every year as I celebrate our Independence Day. And yes! 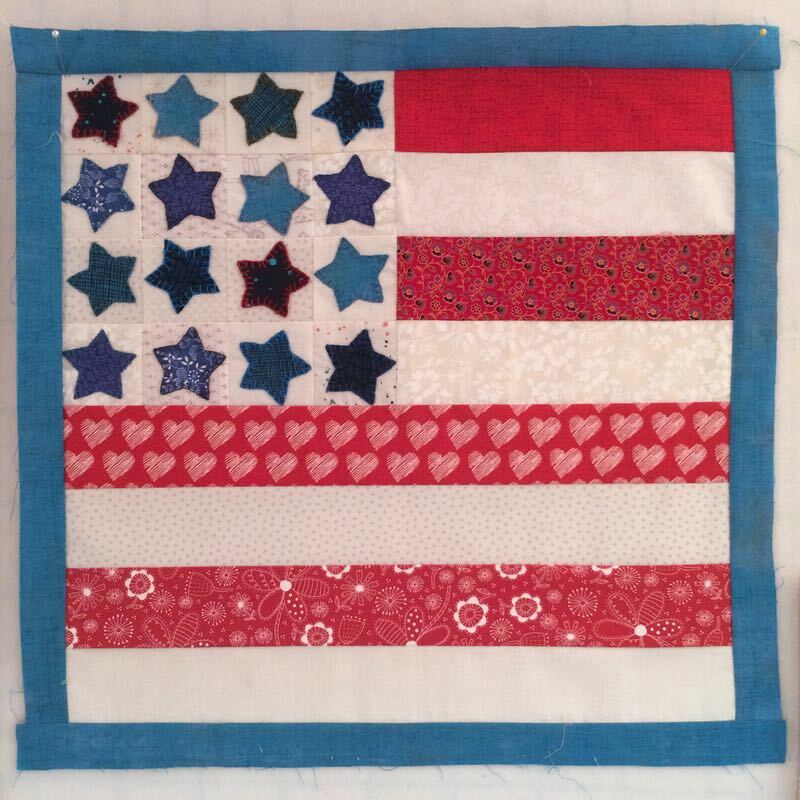 I finished the quilt by my self-imposed deadline of July 4th, so that’s great news. 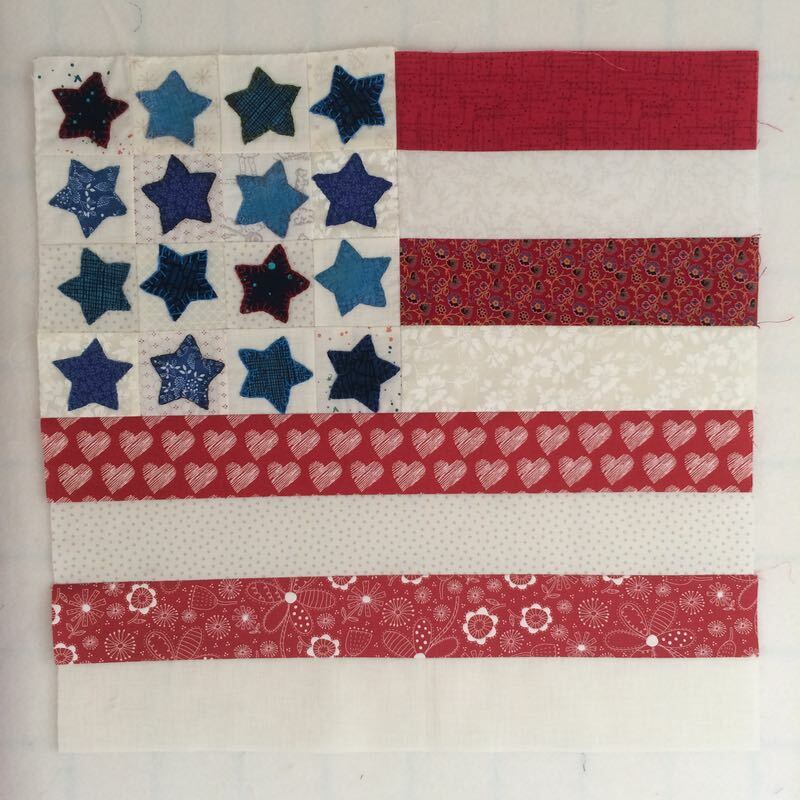 This makes three red, white and blue quilts for me. 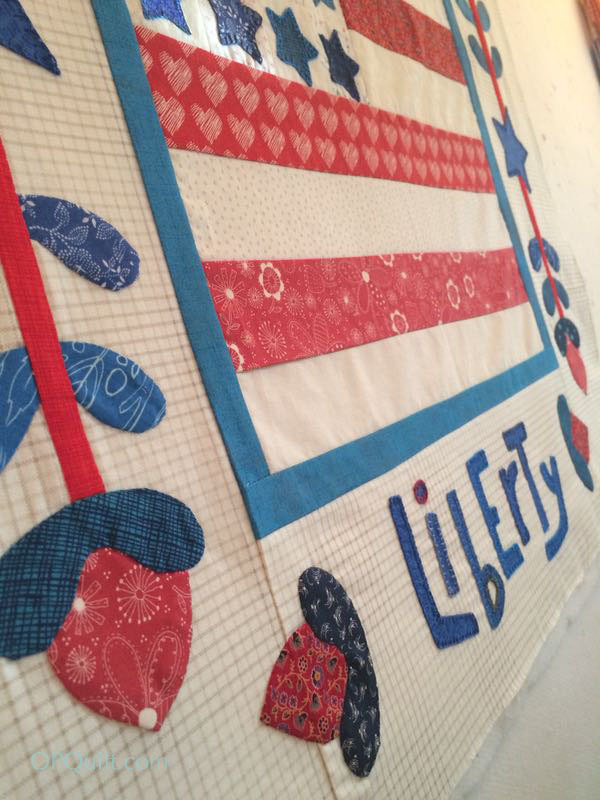 I’m way behind my friend Sherri, of A Quilting Life, who has over a dozen in this collection. 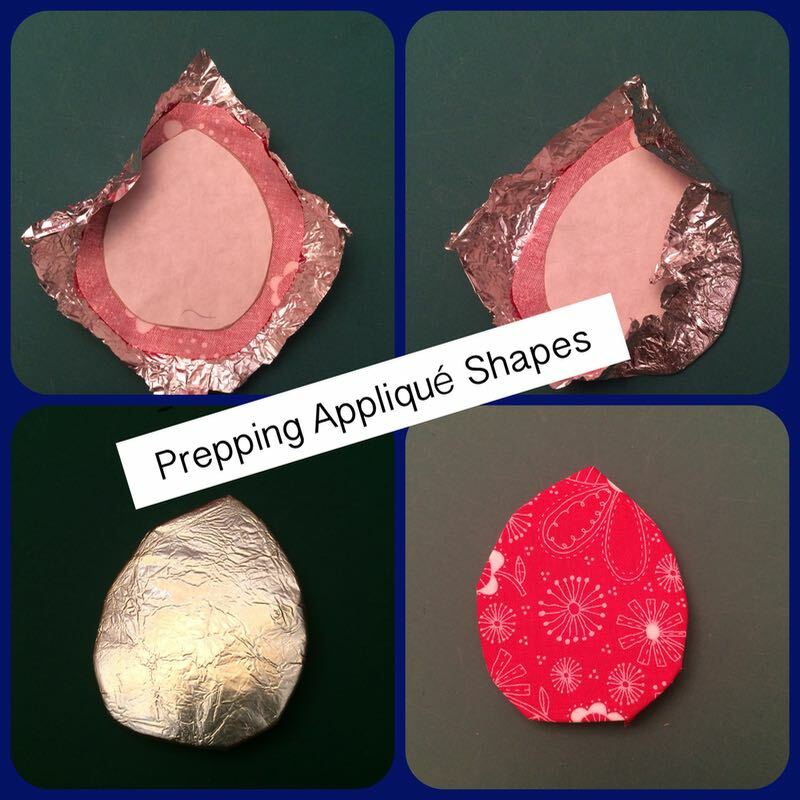 Head over to her blog to get a tour. I’ve got to get busy to catch up with her! 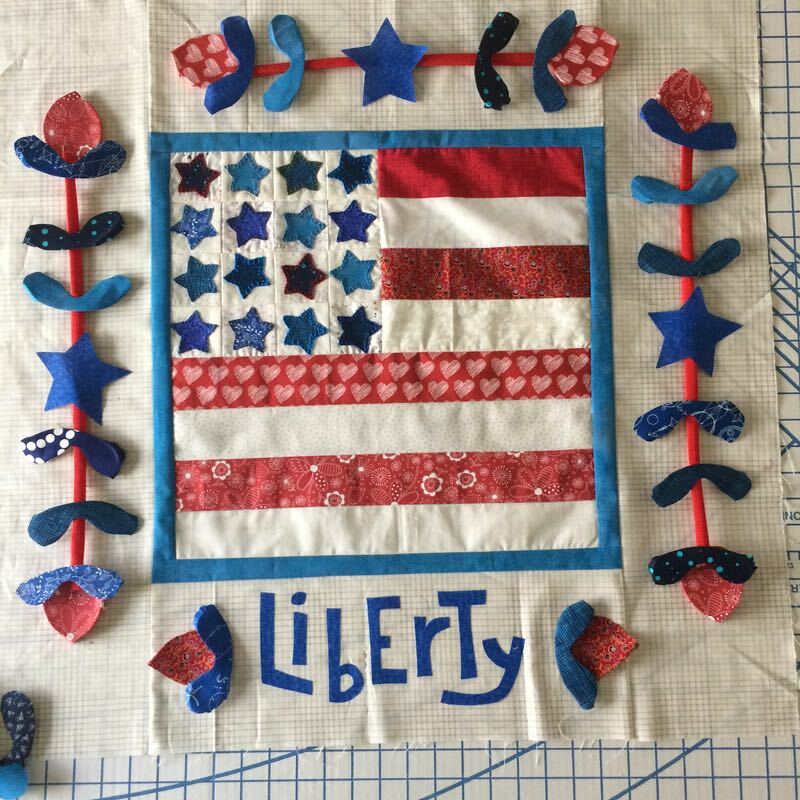 Posted on March 11, 2017 by Elizabeth E.
Well, I finished up the top of my Liberty USA quilt. And in other breaking news, I also was cleared to take off my sling. My hands are now free-er than they were a week ago (and I’m even typing more, rather than dictating) but it’s still a slog for a long while. 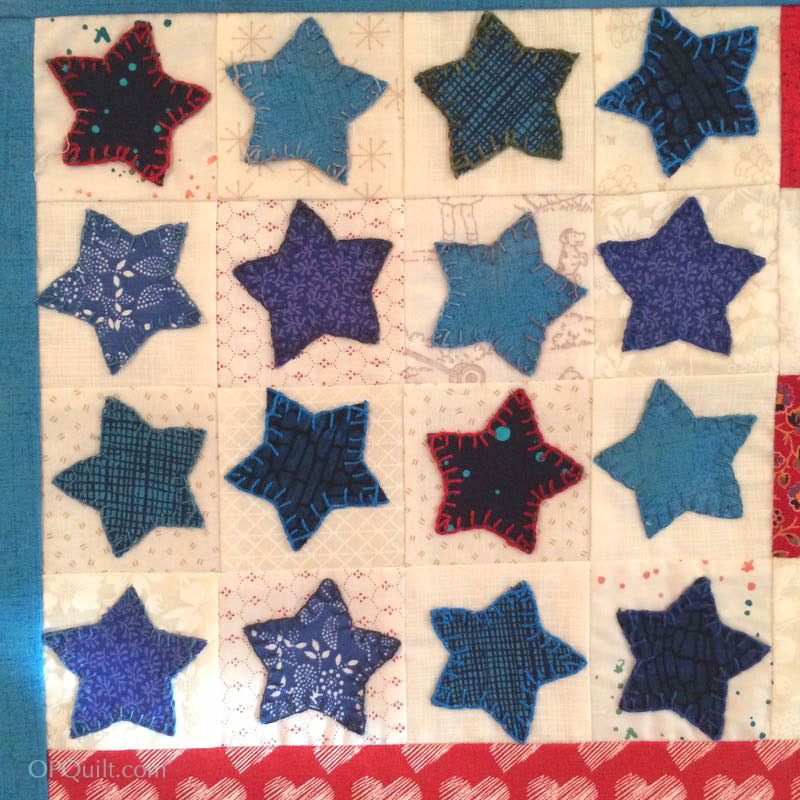 So, this quilt top will rest until I can figure out how to quilt it, since the left arm is more like a wet noodle than a functioning member of a FMQ duo. But it’s fun to be at this place. One interesting drawback to this whole one-arm thing, is that you can’t clean up the sewing room very well. 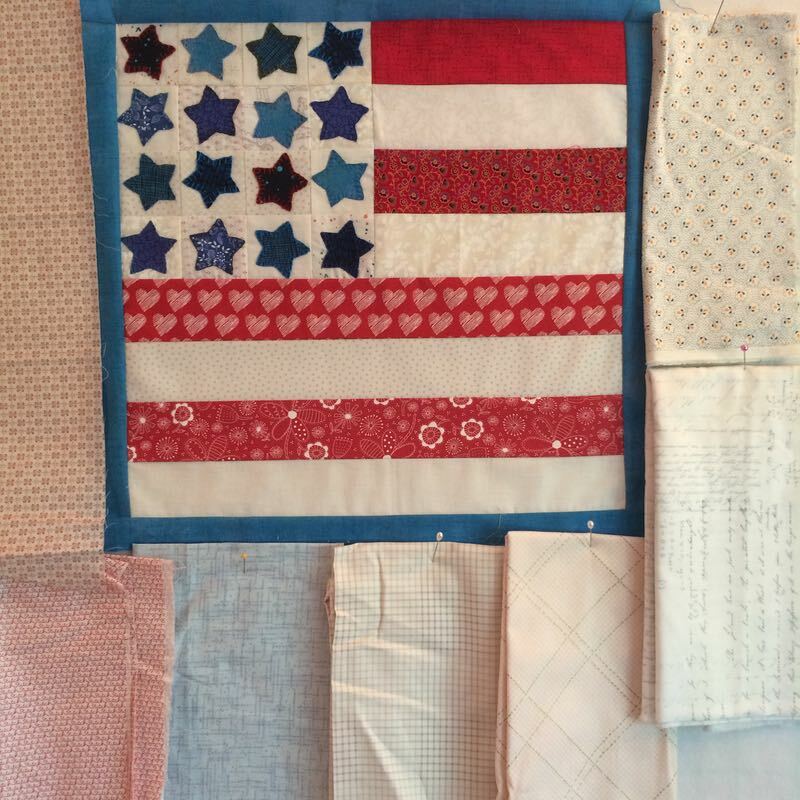 So the day after I got my sling off, I noticed the pile of Sarah Jane scraps on the top of the cutting table, as it was one of the last projects I did before heading into surgery. 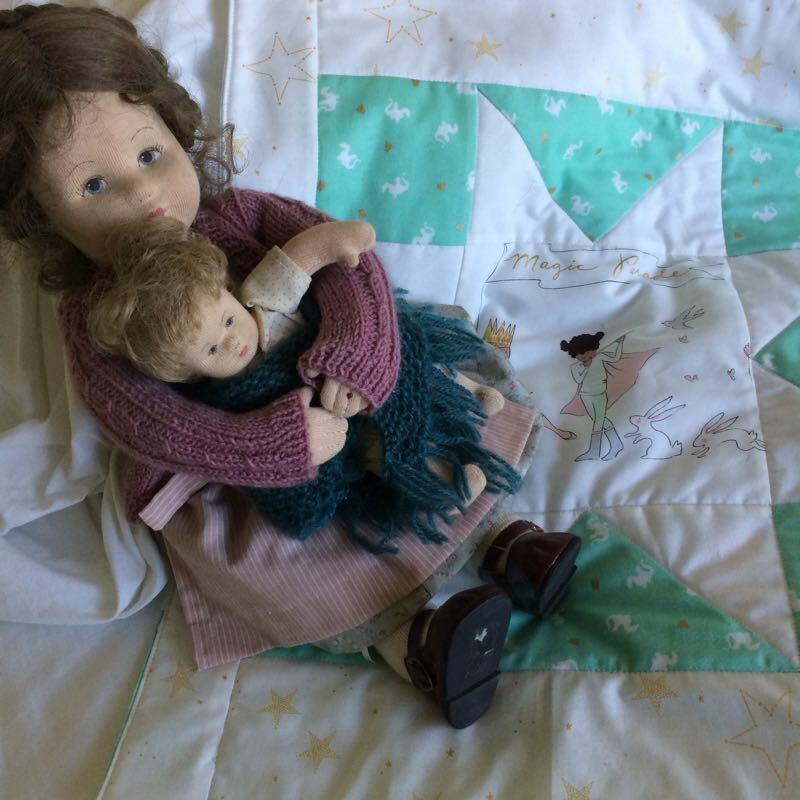 I had wanted to make Eliza a doll quilt to match her big-bed quilt, and now was my chance. I scissor cut some pieces, sewed them together, and finished the top. 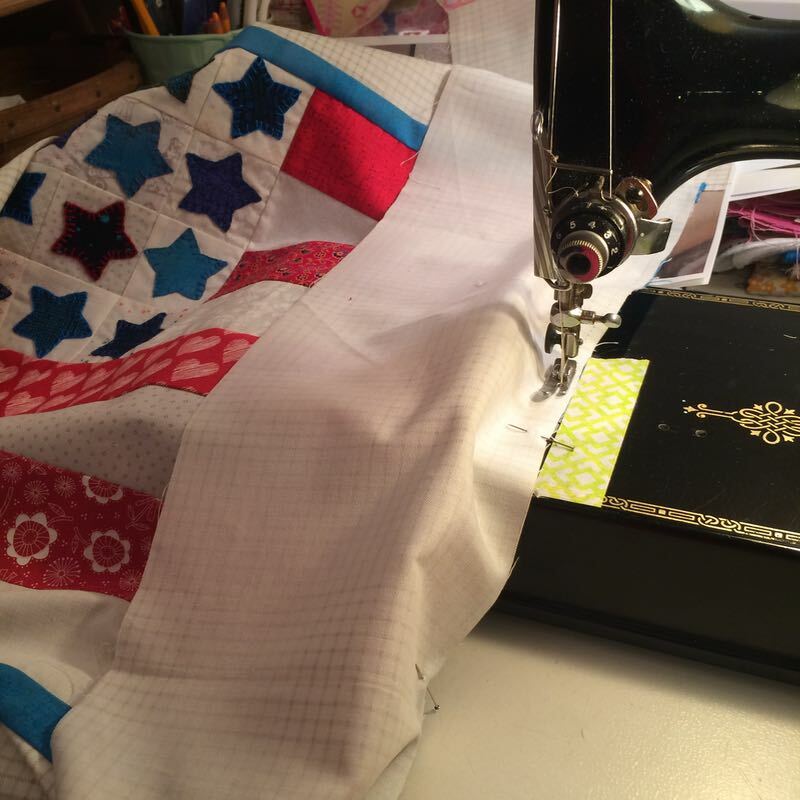 I tried quilting my HQ Sweet Sixteen, practicing on a quilt square scrap, but it was a no go. You need two hands for that. 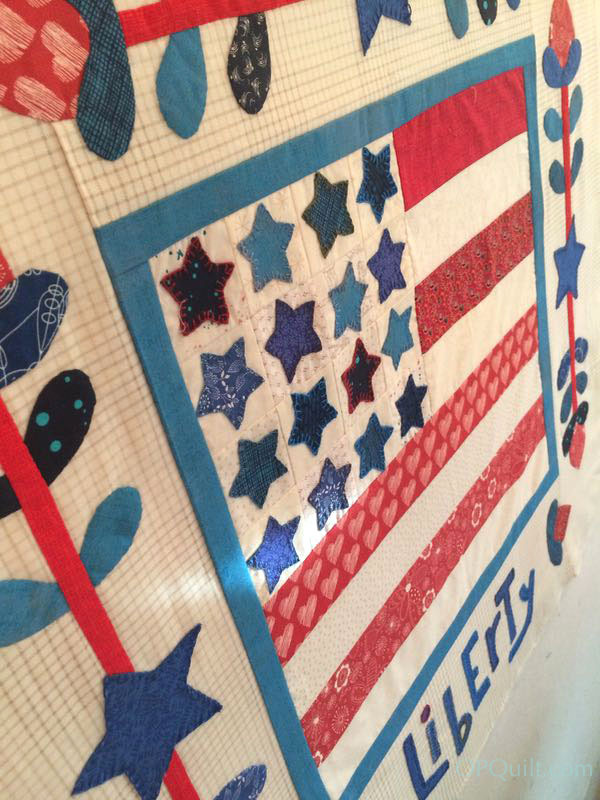 So I used my walking foot on my regular machine and was able to get it quilted. Off it goes into the mail today! I’m not doing much cleaning, or sewing, but I have been doing some thinking about where we get our inspiration from. 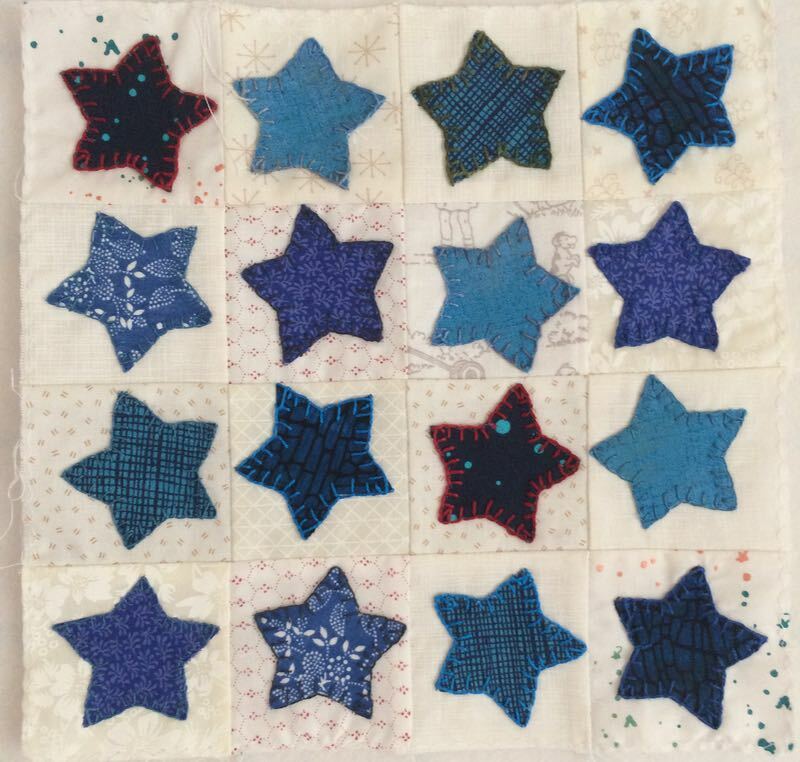 I remember being in a discussion in a class taught by Ruth McDowell, where someone posed the question if she should be acknowledged when we finally finish our quilts. Typically self-effacing, she offered that it would be a nice gesture to acknowledge those that inspired us, or helped us. 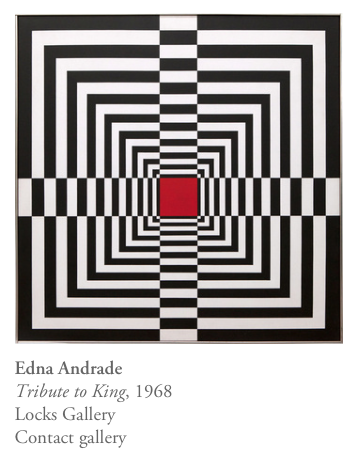 Andrade listed artists who particularly influenced her style including Paul Klee, Piet Mondrian, and Josef Albers. 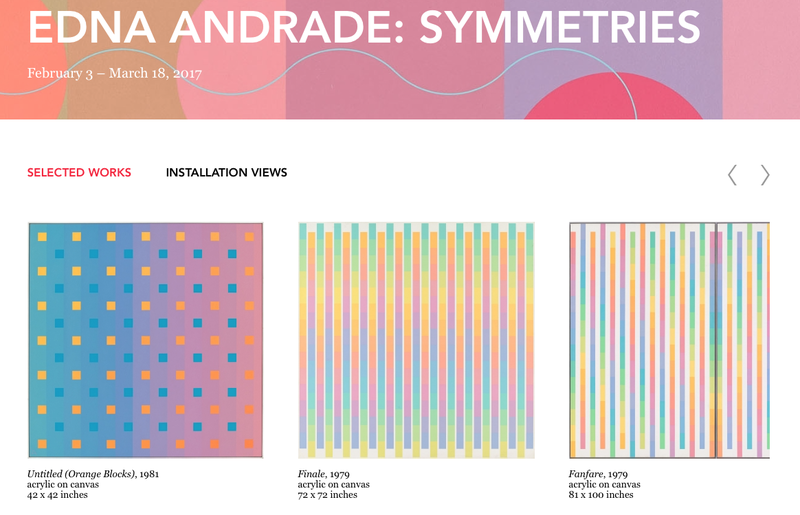 Andrade also notes that she was influenced by architectural design, philosophy, mathematics, and design (Locks bio). She was specifically inspired by things such as astrophysics and Freudian psychology, contributing to the complexity and detail of her paintings. 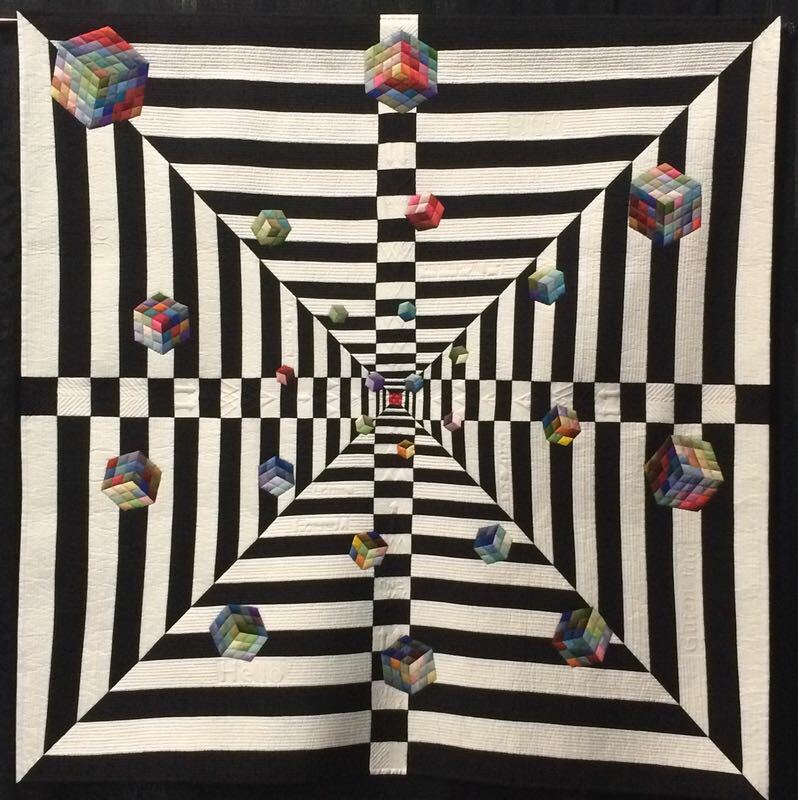 I think many of us are skittish after the Modern Quilt Guild laid down the law on “derivative works” last year, and we are skittish about recognizing where things come from, just in case the Quilt Juries don’t let us in. 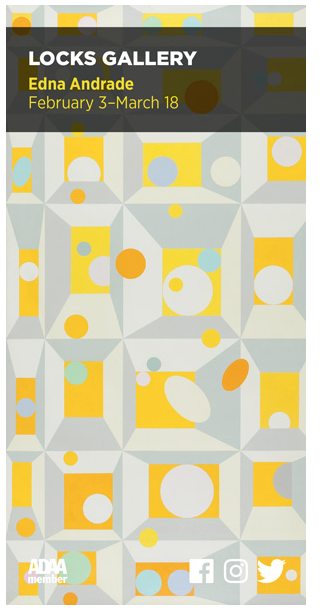 While I do think there is some good things that came out of the pronouncement last year (just how many floating rectangle quilts can we invent?) it also did harm to those of us who dabble far and wide in our inspirations. [For an excellent recap of that tempest, head here.] I hope we come back to a more even pitch, so that we can give credit to things that inspire us, just as Andrade did. 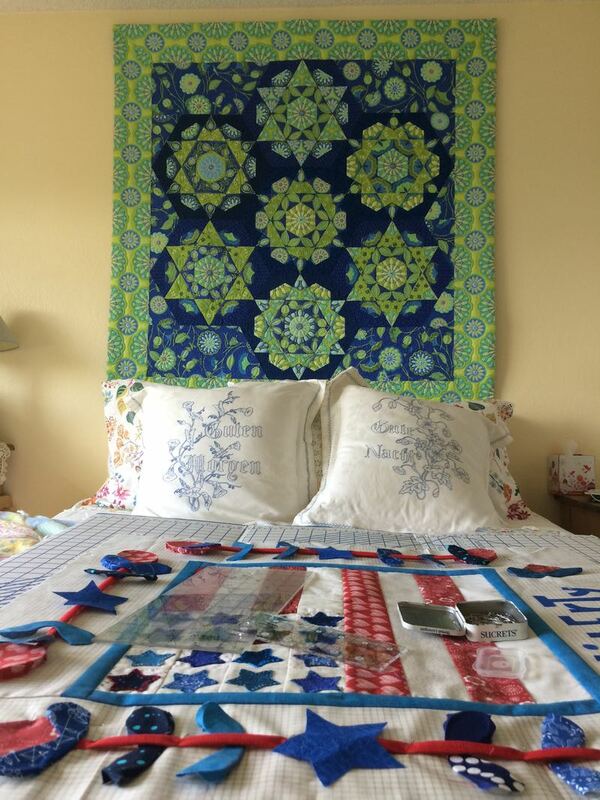 I would never have this quilt if it hadn’t been watching the Apple Keynote address when they launched their iOS system changes a few years ago. 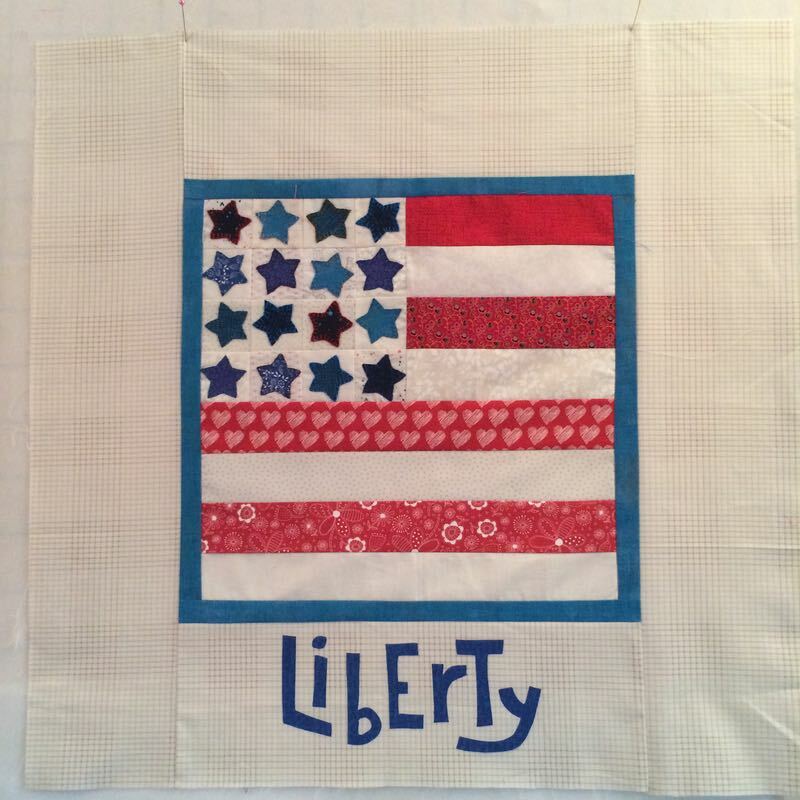 I boldly put the inspiration on the entry form when I entered it into QuiltCon a couple of years, and they rejected it. Did they reject it because of the Apple connection? I’ll never know, but it doesn’t really matter. 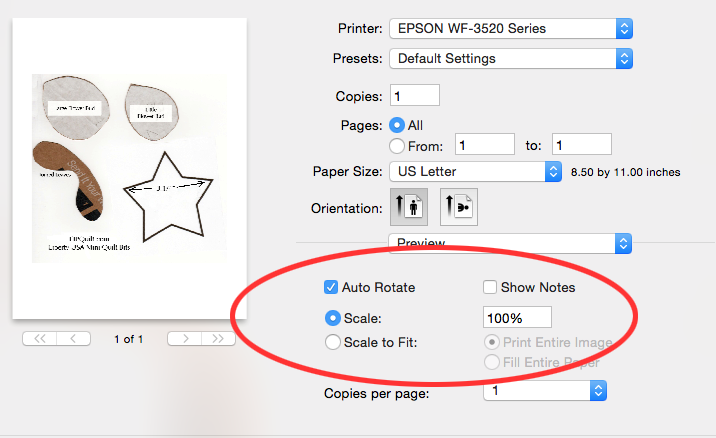 Yes, it’s derivative and yes, I love it. It hangs in the front hallway of my home, and it’s still a favorite. 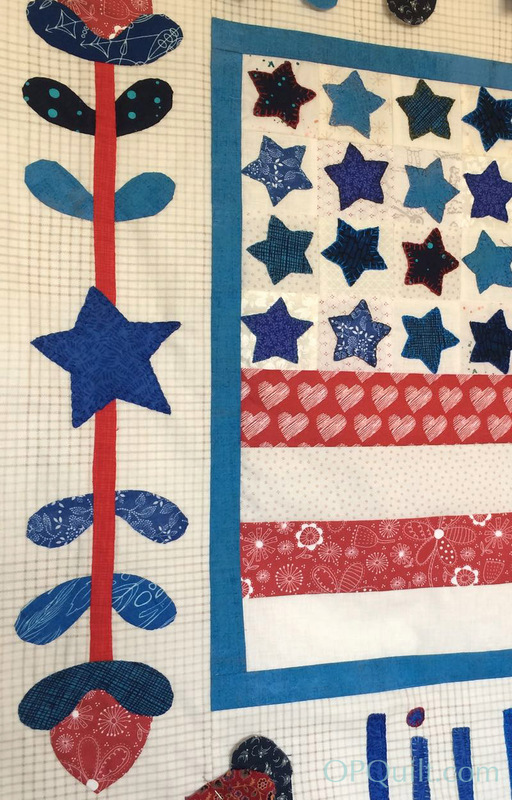 Instead of worrying about whether or not quilt juries will accept our quilts if we springboard off of someone like Andrade, we should make what we love, from what inspires us, and not be afraid of our inspiration.